So the sunshine has come and gone, and come and gone again – as has the rain. There are times during the Great British summer when you need to do something to bring back that warm summer glow. And I’ve found it with this Mediterranean delight! Perfect for al fresco entertaining; it is a wonderfully light but satisfying sharing dish. Here’s my take on Melanzane parmigiana. 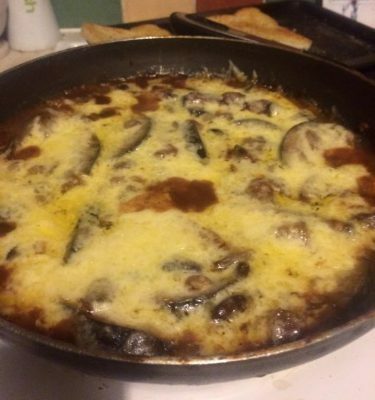 In a griddle pan, fry the aubergine slices on both sides to seal them, until they are all golden brown. Put them to one side. Now gently soften the onions, garlic, chilli, half the basil, oregano, balsamic, soy and crumble in the vegetable stock cube. Pour in the red wine and bring to the boil, then stir in the chopped tomatoes and add the sugar. In a flat oven dish, layer in the aubergines until the dish is full. Pour over the tomato mixture until it covers the aubergines evenly, spreading it around if necessary. Now sprinkle over a layer of grated cheddar and follow with the slices of mozzarella. Sprinkle over the remaining basil and serve with a fresh green salad and a side of sliced garlic herb toast.